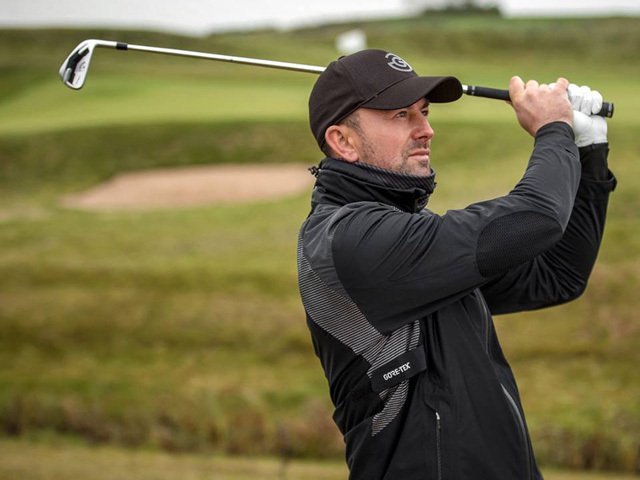 February 3, 2019 – Serious Golfers are better equipped than ever with high performance clothing designed to help them play the game more often even in extreme conditions, according to new research commissioned by leading golf apparel brand Galvin Green among passionate American and British players. Research undertaken by Sports Marketing Surveys Inc. last October canvassed more than 5,000 men (86%) and women (14%) on both sides of the Atlantic who identify themselves as ‘Serious Golfers’ about their playing and buying habits, plus the garments they see as essential for playing the game more often. They claim that being a Serious Golfer comes down primarily to ‘seeking to reduce the handicap figure’ (86%); followed by ‘playing at least once a week’ (69%); ‘practicing at the driving range regularly’ (58%); and ‘playing in all weather conditions’ (42%). On average, American Serious Golfers hold lower handicaps and have been playing much longer, while nearly half those British players who identify with the title (49%) view ‘playing in all weather’ as reason to be called ‘Serious’ and a third will play even in high winds. In terms of protective clothing, the vast majority of Serious Golfers (81%) own a pair of waterproof trousers (74% US/89% UK); well over half (59%) keep an unlined waterproof jacket (68% US/48% UK); and nearly two-thirds (63%) carry a lined waterproof jacket for extra warmth (58% US/68% UK). Interestingly, more than three out of four (78%) are equipped with a windproof jacket (82% US/73% UK); and one in three also have a pair of windproof trousers (33%). More than half of Serious Golfers (57%) view golf clothing as an essential item of golf equipment that helps them play more often, while only 13% disagree. The positive view is held more strongly amongst the British (67%), against 50% in the US, while only 2% don’t check weather forecasts before playing. The main reasons cited for the growing importance of golf clothing are ‘waterproof and windproof protection is increasingly vital’ (80%); ‘new fabric technology is more comfortable & breathable’ (76%); and ‘having complementary layers can enhance performance’ (54%). They are also conscious of the fact that ‘looking the part adds to the feel-good factor’ (49%); and ‘the lightness of modern gear means you can carry more options’ (47%). When it comes to purchasing golf clothing, most Serious Golfers (45%) buy new garments every 1-6 months, with one in four across both nations spending once each month. The majority in America buy from an on-course Pro Shop (35%), while in Britain it’s split between on-course and online retailers. 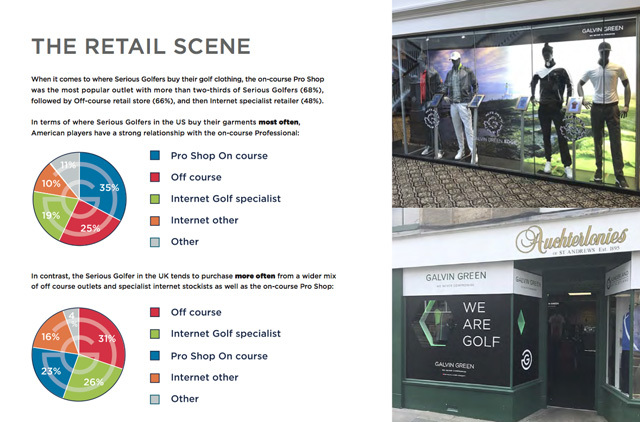 More findings from the Serious Golfer survey are contained in The Galvin Green Golf Clothing Report that charts the progress of the game’s apparel over the past 150 years, from the days of Young Tom Morris to the latest EDGE range of fashionable performance gear. Galvin Green – Ryder Cup gear performs well under pressure – Fact!